As you came from Brasov to Bucharest entering in the village Ciolpani you’ll cross a bridge. Immediately after the bridge, turn left on a small road. You’ll go like this like 2 km until a plate which said to: COMITETUL OLIMPIC ROMAN - BAZA DE LA SNAGOV. From there following this direction you’ll arrive on the pedestrian bridge which crosses theSnagov lake to the island where is settled the church where are supposed to be buried the bones of Vlad Tepes - Dracula. The church was built on a place where a first monastery stood since the XI-th century. The first time it is mentioned in the documents, this monastery appears in 1386 during the time of the voivods Dan I and Mircea the Elder. In 1453 Vladislav II-nd, built here a small chapel destroyed around 1600. In 1456 Vlad Tepes - Dracula built a defensive wall, a bridge, a prison for traitors and thieves and a tunnel under the water which apparently still exists. On this island full of mystery and haunted by the souls of the deceased killed here, was built the church of Neagoe Basarab in 1521. During the reign of Mircea Ciobanul the church was repaired and painted in 1563 by Dobromir cel Tanar. The church it was used as a royal necropolis housing the tombstones of the nobles beheaded for treason. 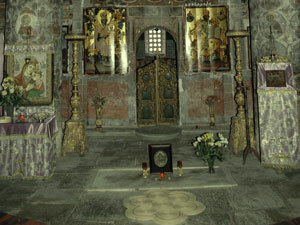 In front of the altar can be found the tombstone which apparently belongs to Vlad Tepes - Dracula. I have my doubts mainly: when he was buried in 1476 after being killed why was transported here to a church built only in 1521 ? This is only one of my doubts. I have another ones too.